It’s been very hot in Sydney lately. I don’t mean to complain, but we’ve had days where it’s been near (or right at) 110F; that’s seriously crazy! As you may understand, I haven’t been baking very much because of this heat. Instead, I’ve been trying out an assortment of chilled sweet foods, such as cheesecake pots (today’s post), yoghurt parfaits, sorbet and cool drinks. In December, delicious. magazine released its first ever “Summer Special” issue. Unfortunately, this issue didn’t make its way to subscribers as we actually to buy it in the shops! There are a lot of lovely things inside this issue, though, such as the recipe I’ll be sharing with you today for raspberry cheesecake pots with a brownie base! This is a recipe you can prepare with a snap of your fingers and is perfect for entertaining. The base of these cheesecake pots is pure brownie. I didn’t even turn on the oven to bake a batch of brownies; I just bought a package of brownies from the bakery department of my local grocery store. 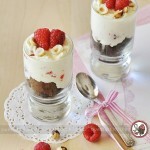 On top of the brownie base is a smooth, luscious filling of cream cheese, cream, vanilla beans and fresh raspberries. 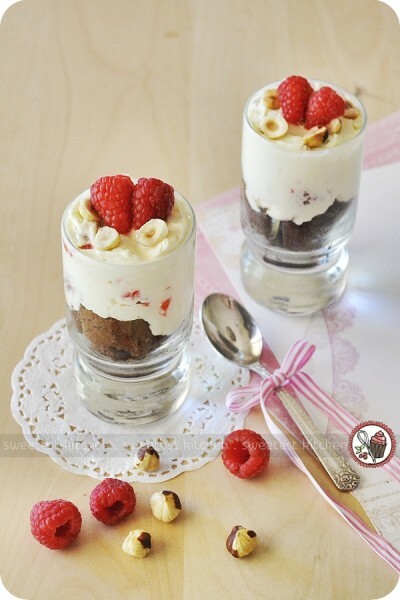 Each cheesecake pot is topped with a few toasted hazelnuts and extra raspberries. Simple, beautiful, elegant and delicious! A simple chilled dessert, perfect for entertaining. Using an electric mixer, beat the cream cheese with the vanilla and icing sugar to combine. Add cream, beat until smooth and thick (do not over-beat as the cream may curdle), then, reserve some raspberries to decorate and stir the remainder into cream cheese mixture, mashing some to get a pretty raspberry-ripple effect. Divide the chocolate brownie pieces among 6 dessert glasses. Top each with the raspberry cream cheese mixture, then sprinkle with hazelnuts and reserved raspberries. To toast hazelnuts, preheat oven to 180C. Spread nuts on a baking tray and roast for 6-8 minutes (watch carefully as they may burn). Transfer to a clean tea towel and rub the nuts the remove skins. What a cute idea! Hope it cools down for you soon! Ooh, those look wonderful. It’s the dead of winter here in Southern Ontario, but I do have frozen raspberries which may not look as pretty, but should do the trick. Thanks for sharing! These are wonderful! I love brownies and cheesecake. This recipe is perfect for me!